When you apply for a library card, you agree to return borrowed materials on time, pay overdue fees and assume responsibility for lost or damaged items. Your library card is valid as long as you use it at least once every three years. 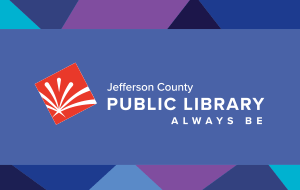 If your card is lost or stolen, call or stop by any Jefferson County Public Library location to inform a staff member. Please keep your contact information up to date in My Account. Jefferson County library materials may be returned to any Jefferson County Library. Book drops are open 24 hours. Login to My Account to manage checkouts, renew online, place holds, pay fines, and see your reading history. Keep your information in My Account up to date to receive hold and renew notifications. To ensure the privacy of your library account information, please remember to bring your library card or account number when checking items out. Account numbers are also required when checking items out for family members or friends, and for parents needing access to their child’s account. A government issued photo ID can be used as proof of identity if you don't have your account number or have lost your card. You may check out a total of 99 items, and have up to 60 holds on your library card. You will be notified when your hold is available by email or phone. Print and audiovisual items for adults and teens accrue fines of .20 cents per day after their due date. The maximum fine on any item is $4.20. Materials intended for kids ages 11 and under with a call number beginning with Board, E, Reader or J, do not accrue fines. If you have questions about the fines or fees on your account, please visit any Jefferson County Public Library or call us at 303-235-5275 with your library card or account number. Do you send reminders when something is due? How long can I check materials out for? Why won’t something renew? What does this mean?